Following instructions from a very worried client in Kingston-upon-Thames, a survey was carried out by one of our Property Care Association (PCA), qualified damp and timber surveyors, on what was suspected to be water leak damage to a kitchen that had recently been refitted. Our surveyor attended the property to inspect the damage, as far as was possible and meanwhile we advised our client to inform his insurance company. It was found that there was considerable damp under the floors which over a period of time, saturated and rotted the timber. A very detailed report was submitted to our client to pass on to the insurance loss adjusted. On confirmation that the insurance company confirmed liability, we were instructed to commence the restoration work. 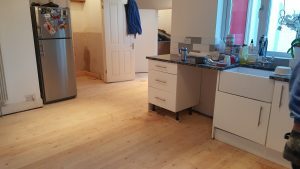 Prior to exposing the damage, or trained and experienced operatives had to remove and set aside all of the new kitchen base units, which included very carefully supporting the granite work tops with special props from the oversite. Once all of the defective timbers had been exposed we located the long term water leak that we suspected, within a void at the back of the base units, which over the years had caused extensive timber decay to the to existing timber floor and joinery timbers. Part of the floor had an old concrete section, which was also saturated and without a damp proof course. This was completely removed and new brick piers were built, prior to laying a complete new timber floor using new pre-treated timber. All of the damp plaster at the base of the walls was removed and re-plastered in accordance with our damp proofing specification, prior to fitting new, specially machined, joinery timbers which were primed and fitted to match existing. Finally the kitchen was refitted and all was left for our clients own decorator to decorate. We have been continuously trading since 1971 and have carried out thousands of water damage repair projects for many leading insurance companies and loss adjusters. All of of our water damage repairs are covered by our established 20 Year Guarantee which is insured by Guarantee Protection Insurance (GPI). We are proud members of the Property Care Association (PCA), TrustMark (Government Endorsed Standards) and an accredited Which? Trusted Trader. Don’t take a risk with shrinkage and secondary water damage, you are only insured once, so use London and the Home Counties expert, Call Tapco HomeDry first, to do it once, do it right.